Had some time this morning since I am not working so I decided to make a real keto diet breakfast which I do now and then. It is a very simple omelet that contains a lot of good things inside which makes it taste just excellent. I can eat this omelet both for lunch and as a breakfast and I have it maybe once per week or sometimes even more often than that. This is a perfect dish to make when on a keto diet and it is also so easy to make this type of keto breakfast. Start out by taking 3 big eggs and crack them into a bowl. Whip them up together with some salt and pepper and then fry the eggs in a pan on both sides until it is done. Do not forget to add plenty of butter and olive oil in the pan first. 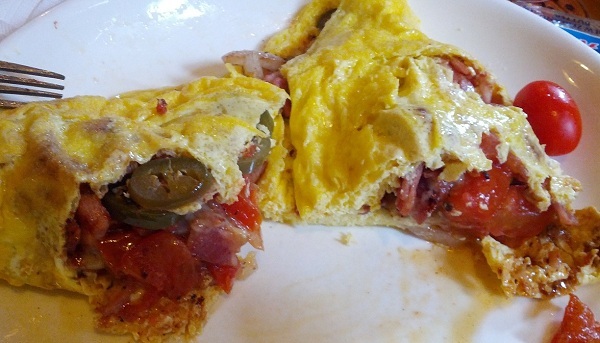 As the main ingredients for this keto diet breakfast omelet I use bacon, ham, tomatoes, sun dried tomatoes, jalapenos, onion and some spices. I fry the bacon and ham together until it gets a nice color and then I add on the chopped tomatoes and onion together with the jalapenos. Let it all fry together for around 2 to 3 minutes and then add on plenty of cheese on top and let the cheese melt. I also add on some sun dried tomatoes on top and also add some chili powder spices and some Tabasco sauce to make it a little more spicy. Once the cheese is all melted and everything is nicely mixed it is done. Then simply take all the ingredients and add them on the omelet and wrap it all together. Your keto diet breakfast omelet is ready to enjoy. Some recommendations is to try it out with different ingredients. The ingredients listed above are the ones I enjoy the most but there are so many other things that you can put into an omelet. Try out different things and see what you like the most. For more keto breakfast recipes, ideas or tips we recommend you to take a look at dietketo.com. This entry was posted in Recipes and tagged keto diet breakfast, keto diet breakfast ideas, keto diet breakfast recipe, keto diet breakfast tips on June 29, 2013 by Johan Bengtsson.